I got up this morning to find the girls downstairs with Rick. It’s his day to wake up early with the girls. 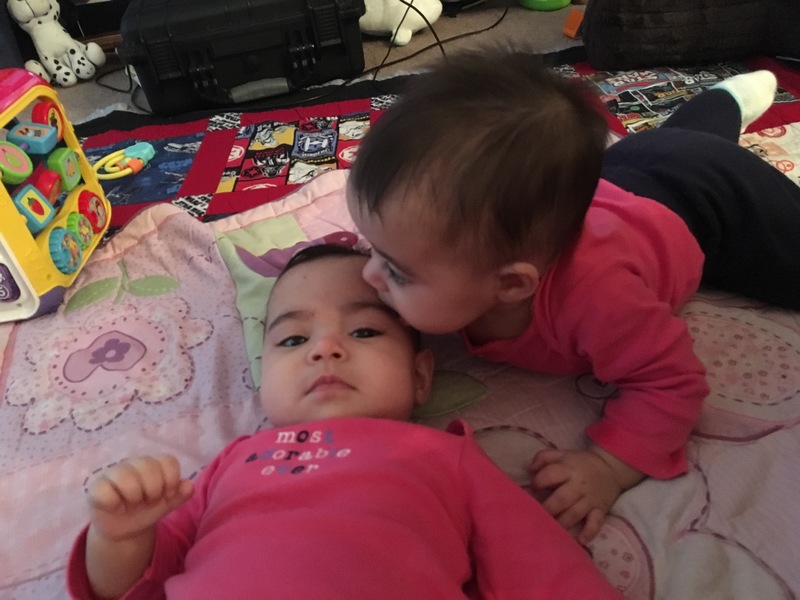 I’m usually able to hang out for an hour or so before I have to get ready for work, only to return with an hour to spare with the girls, but I had to take the car for an oil change before work today, so I had time to kiss their fat cheeks and tell them I love them about one hundred times. It’s become increasingly hard to continuously do that. At first, going back to work felt like a “vacation”. It was “me” time. Even though it’s still amazing to be able to get out of the house, I’ve hit a wall. Well, picture it like the giant Wall from Game of Thrones, but instead of keeping White Walkers from coming into the North, it keeps guilt away from Camilaland. Much like in GoT, guilt must have gotten its own dragon and made huge hole on my wall, letting guilt through (I want a dragon, damn it. Come on, inner Kahleesi, get it together). I hate leaving for work. I hate looking at their happy faces, filled with joy and expectations of seeing and spending the day with mommy, only to have to leave them and only get a couple hours with them a day. I hate not being able to have the time to work on what they need to work on for their PT treatments. I hate having to see them through pictures and videos that either my husband or Emerson, our manny, sends me while I’m at work. I hate hearing of them doing things well or new things while I’m not home with them. I hate feeling like I’m missing out on their babyhood because we can’t afford to have me not work. I find myself annoying my coworkers by shoving videos of the girls in the faces, saying “LOOK AT HOW CUTE THEY ARE I JUST WANNA GO HOME BUT I CAN’T BECAUSE SUPERVISOR”. I constantly look through pictures of them and go through all the videos I have of them (thank the Universe for Apple’s iCloud) when I’m not working a flight. Every time I hear a baby crying or laughing or voicing their tiny opinions, I have to swallow hard and fight back the overwhelming desire to drop everything and drive home. 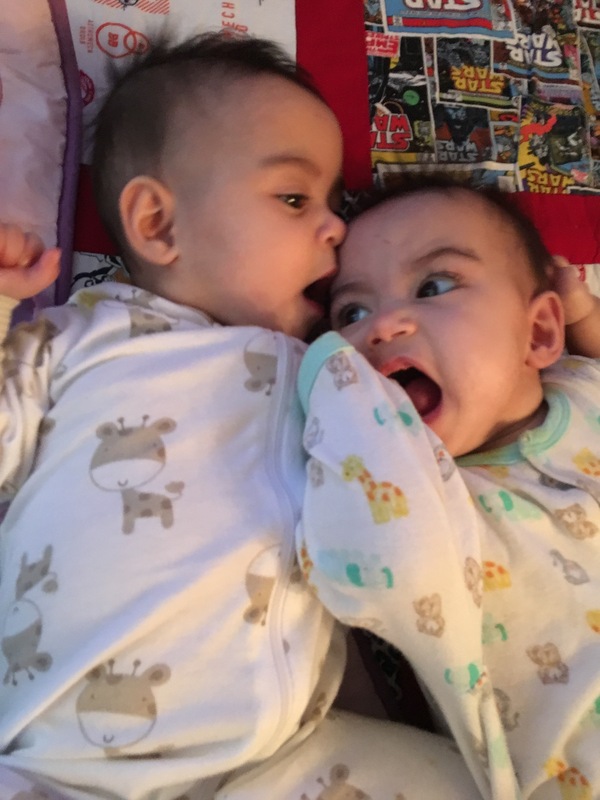 I find myself talking about them to every parent I check-in or board, showing their little faces, telling them that yes, I might have my hands full, but I wouldn’t trade it for the world. My mother-in-law, Terri, also had to keep working when Rick and Tony were babies. Though they’re 5 years apart, the guilt was also there. My mom was lucky enough to be able to stay home with me and my sister, 18 months apart, until I was 5 or 6. The vast majority of my friends with twins, two under two, and three under three, has also had to keep working. It’s a sad reality we as mothers have to come to. Our babies spent months inside our bodies, we loved them before they were even fully formed, and we vowed to care for them at all times unconditionally. Well, working is part of that vow. Making sure they’re fed, clothed, and have everything they could ever need or want requires financial stability, so we go back to work and build up our own Walls to keep ourselves in check. We tell ourselves we’re not neglecting our babies, we’re doing this for them. We tell ourselves that we should be happy to be able to “return to our normal”, that we should be proud to bring a second income to the family. What we should also be telling ourselves and each other is that this guilt is also normal and part of motherhood. That we shouldn’t have to keep quiet about wanting to go home to our babies. That we are doing amazing things – we care for ourselves, husbands/wives/partners, our home (to an extent), our pets, and tiny humans. We are badasses. However, being a badass doesn’t mean you don’t feel anything. Working mom guilt is real and every mom has it. Time to go take care of that giant hole on my Wall before I have to work my next flight.